Squid Ink’s CoPilot 382 printing system is designed to print superior quality hi-resolution characters of either porous or non-porous surfaces. 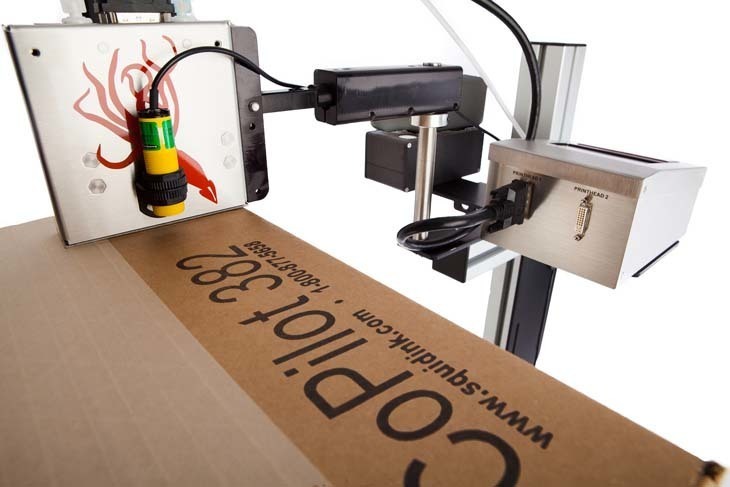 With up to 2.1” of print height per printhead and the ability to run up to 2 printheads from one controller, the CoPilot 382 offers a versatile, yet cost effective solution for your coding and marking applications. The system is capable of running oil-based or solvent-based inks to print up to 4.2” (2.1” from a single head) of hi-resolution characters, razor-sharp text, scannable bar codes, and great looking logos at 185 dpi. For non-porous applications, users have the option of using Squid Ink’s solvent-based inks for printing on a variety of products like coated cartons plastics, glass, stretch wrap, metals and more. Squid Ink’s PZ-1000 ink for porous substrates offers low-maintenance performance, eliminating the need for auto-priming functions and offering better ink utilization than competitive systems. As the newest addition to Squid Ink’s growing family of marking and coding systems, the CoPilot 382 lets users meet the GS1 barcode specification for less. Any way you look at it, Squid Ink’s CoPilot 382 provides users with an affordable solution to meet their ink jet coding needs.